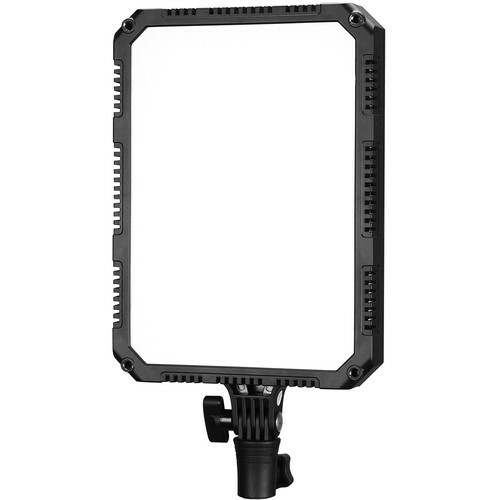 Measures 12 x 7 x 3"
Size: 12 x 7 x 3"
12 x 7 x 3" 16 x 9 x 3" 22 x 14 x 4"
26 x 16 x 3"
32 x 20 x 4"
The Compac24 Daylight Slim Soft Light Studio LED Panel from Nanguang is an ideal choice for the studio or location work where color accuracy, control, and flicker-free output are of major importance. The Compac24's daylight-balanced output is well suited for outdoor work or color-matching HMI fixtures, or other lights' presets while its high CRI of 95 is an indicator of faithful, precise color rendering. Dimming from 100 to 0% is conveniently done on the back-panel LCD display with negligible color shift. The low electrical draw of just 24W means a timely return on your investment. The Compac24 can be used worldwide thanks to its included 100-240 VAC power adapter. Nanguang Compac Series Studio LED Panels create diffuse, color accurate, studio lighting with minimal set up and zero complications. Perfect for lighting interviews, headshots, still life photography, vlogging, and more. Combining a space-saving design with impressive brightness, Compac series studio LEDs achieve lighting similar to large softboxes but at a fraction of the size and none of the set-up time. Achieve studio-quality results without adding filters or cloth diffusion. Control brightness from 0 to 100% and color temperature is set to 5600K for compatibility with other light sources and camera white balance presets. The Compac's LCD panel shows you exactly what settings you're using, making it easy to fine tune and then recreate them in the future so your results will always be easily repeatable. Box Dimensions (LxWxH) 14.05 x 7.55 x 3.8"